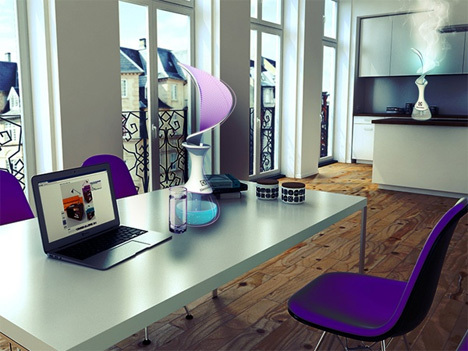 Humidifiers don’t really scream ‘modern,’ ‘design’ or any incarnation of the two words. Stereotypically linked to nerds with dry nasal passages, they usually look like cheaply-modeled oversized toasters. They also often sound like they’re on the verge of collapse and have minimal features. Designer Fanni Csernátony wants to break down these stigmas. 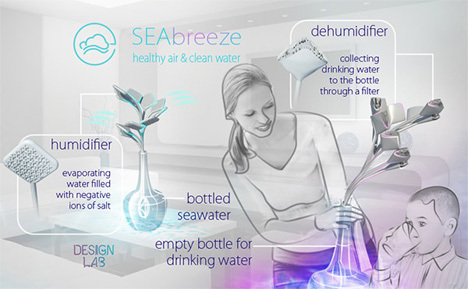 She does so with SEAbreeze – a 2013 Electrolux Design Lab semifinalist. More than just a humidifier, it’s a “healthy air & clean water” system. The two main components look like high-end artisan vases. The humidifying ‘vase’ holds salt water and emits a pleasant scent reminiscent of a seashore; the other absorbs excess humidity and sends it through a carbon filter, creating clean, desalinated drinking water. Both are regulated by a completely silent ventilation monitor. 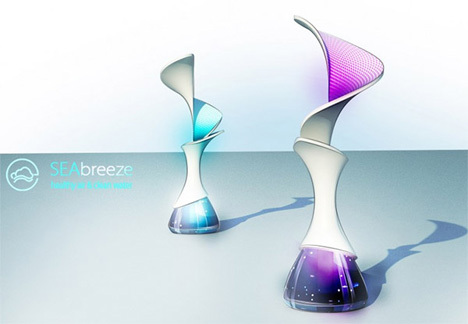 When placed at opposite ends of a room, the SEAbreeze creates a gentle, flowing draft that gives off the same good vibrations one might get while lounging on a beach. And as a multi-tasking appliance, its efficiency is almost as attractive as its aesthetic.